Aalayam - Colors, Cuisines and Cultures Inspired! : Inspiration Station: Dasara Bombe Habba!! Inspiration Station: Dasara Bombe Habba!! As we get ready for Dasara this week, allow me to indulge in a little bit of a story telling, and in the sharing of pictures from my doll arrangement this year. Dasara, being my favorite festival of the year got me getting a head start on the arrangements last weekend! Just so I could bring in the inspiration for Aalayam! See how much I love you? Dasara festival, the biggest Hindu festival, both in terms of scale and mythology, has gotten larger and grander in my wedded home, year after year, since I got married and started orchestrating the festivities. My mother used to make (and still does) elaborate Dasara arrangements in my maternal home, with a 7 step display of Dasara Bombe (dolls), and a scrumptious dinner party for all of our extended family back when I lived with my parents. Now that I am away from “home”, in the USA, I delve back into my childhood memories, and tap into my child like enthusiasm as Dasara approaches, getting ready to reconfigure my doll display, get into Skype yeladakke visits with all my friends and relatives, and of course, prepare for the Aalayam photoshoots. And it never fails to excite me every single year. I am delighted that I have two little helpers, my twin 5 year old daughters, who participate with enthusiasm in the storyboarding of the doll set up, negotiate fiercely as to which dolls can be “borrowed” from their collection, vs. not, and generally add a festive buzz to the whole proceeding. And some years, like this one, I have the good fortune of having the grandparents on board the festivities as well, they partaking with delightful joy in the tradition…becoming a child once more….joining in the fun. So, here goes, Dasara Bombe Habba –Aalayam 2014 special ! (that’s most of what’s written in Kannada script in the first graphic) from our humble home. Let’s delve a little bit into the mythology and significance of Dasara. The festival of Dasara is unique in its perception and significance. According to the great Hindu epic Ramayana, Lord Ram killed demon king Ravana on the tenth day of war, that is known as the “Dussehra”. Ravana is said to have abducted Ram’s wife, Sita and was also known as a dictating ruler, and he was vanquished by glorious Rama. As par for the course, Dussehra or Dasara festival symbolizes triumph of virtue over sin or immorality. The end of Ravana meant end of the embodiments of evil and malice. Forms of celebrations can take on a wide variety of manifestations, ranging from worshipping the goddess Chamundeshwari (Durga) to exhibiting colorful dolls on the day of "Bombe Habba" (festival of miniature idols or dolls). There is a legend related to the exhibition of dolls that is also known as Golu. Since the goddess Durga needed tremendous power to fight over evil, all other Gods and Goddesses transferred their power to Goddess Durga and they all stood still as dolls. To respect the self-sacrifice of these deities during the festival days, Hindus revere dolls that are in shape of particular Gods and Goddesses.﻿ Of particular significance is the "Dashavatara". The "Dashavatara" of Indian mythology can be linked to Darwin's theory of evolution. Here are the incarnations: Matsya (Fish), Koorma (Turtle), Varaha (Boar), Narasimha (Half-Man, Half-Lion), Vamana (Dwarf), Parashu Rama (Man weilding an axe), Rama (Man, Ruler), Krishna/Bala Rama (Man, Politician), Buddha (Man, Ascetic), Kalki (Man, Destroyer) are all represented and revered as miniature dolls. Click here for a picture post full of Dashavatara incarnations, and the mythology behind each incarnation. Now, let me take you on the grand tour of this year's Bombe arrangement from our home. Let’s start with my favorite arrangement of the lot – The Mysore Dasara procession shall we? Mysore Dasara is the Nadahabba (state-festival) of the state of Karnataka in South West India. On Vijayadashami, the traditional Dasara procession (locally known as Jumboo Savari) is held on the streets of Mysore city. The main attraction of this procession is the idol of the Goddess Chamundeshwari which is placed on a golden mantapa (which weighs around 750 kilograms of gold) on the top of a decorated elephant. This idol is worshipped by the royal couple and other invitees before it is taken around in the procession. Colorful tableaux, dance groups, music bands, decorated elephants, horses and camels form a part of the procession which starts from the Mysore Palace and culminates at a place called Bannimantap where the banni tree (Prosopis spicigera) is worshipped. According to a legend of the Mahabharata, banni tree was used by the Pandavas to hide their arms during their one-year period of Agnatavasa (living life incognito). Before undertaking any warfare, the kings traditionally worshipped this tree to help them emerge victorious in the war. The Dasara festivities would culminate on Vijayadashami with an event held in the grounds at Bannimantap called as Panjina Kavayatthu (torch-light parade). Remember, we said that the classic interpretation of Dasara, is revering mythology, but the modern version of it is celebrating everyday life? Next, on to community living, and some fun! In this most endearing display of “Nammoora Halli” or “Our Village”, I am storyboarding industriousness, sustainable living and entrepreneurship amongst rural Indian women. You see these gorgeous ladies in this display making a livelihood, by cheerfully carrying supplies, pounding spices, driving wagons and acting as the bread-winners in their homes by doing what they do best – nurture, serve and protect. We then move along to the market place, manned by none other than Mr. & Mrs. Shetty – they symbolize the “vypari” or the merchant in the social strata of India. This particular couple is selling a variety of spices and condiments, waiting to welcome onlookers and customers into their store, whether it just for local gossip, or to make a considerable purchase. Beware, you cannot fool savvy Mr. Shetty, for he sure will make you pay the price, while still keeping up with the chatter! Not to be undone, we have Subamma, who has set up shop, right next door. Selling snacks, (they sure are spicy – have you seen how many habanero sauce bottles she has in stock?) and Tiffin, Subamma, calls herself a “Dinasi Angadi” meaning “General Store”, but that’s only because she does not have a food license. That sure does not stop her from whipping out dosas and idlys by the dozen to hungry travelers. Does it? We then present an ode to everyday entertainment, far back from the time where there was no 24/7 cable TV, internet and smart phones. Presenting to you the “Grand Circus”, replete with a non-creepy clown, puppets, a ringmaster, magicians and acrobats! The Indian classical musicians cannot be left far behind. Here they are, orchestrating a “Kacheri” with all their favorite string and percussion instruments, facilitating the conjugal harmony of Krishna and Radha in a swing nearby! Speaking of conjugal harmony, we have our own take on “happily ever after” with “Winter Wonderland”. Here we have Prince Charming and Princess Incognito serenading each other in a snow filled landscape, replete with magical fairies, elves and friendly trolls rollicking around in a Disneyesque environment! In Dasara, we revere mythological heroes; however, it only is fair that we honor our real life heroes also for good measure right? Here we have the local firefighters in a daring rescue mission, carrying a baby out of a smoky building. Standing far away and watching with wonder is Caillou, a Canadian children’s TV star, who has just returned from school! (This was my daughter’s storyboard, in case you are wondering). You see, this gets real animated. And really interesting and fun once we get into the groove of the festivities. If you have been following my Dasara bombe set up every year, you have seen my collection of dolls grow, and my display evolve into something alive, something fun, and something memorable for me, my friends and my family. Settled in far flung corners of the world, we Indians are bound together by a common heritage..a shared joy that abounds in nostalgia of festivals we celebrated while growing up! It is a joy to see virtual family and friends here in the blogosphere, and social media revel in the same delight about my doll display and storytelling, that I once did as a kid! It is my aspiration that I keep on adding to this doll collection every year, and continue to think of new ways to present the most magnificent version of a story, or a concept and of a myth. I aspire to bring to life community norms, societal traditions, fantasy and reality, and weave it together in the form a story. For me and my children to enjoy…What better way to do this than during Dasara, where tradition predicates the story telling, and culture presupposes creative expression? I aspire to keep color and culture at the forefront of my story telling, and it’s so easy today with everything being digital. I aspire to keep native aspects of our culture at the forefront of my story telling too, and that's tough to retain with everything being new age and western. Whether it’s the safekeeping of the “Pattada Bombe” or the married couple doll set that gets gifted to every married woman as part of her wedding trousseau (I have two, although I got married only once! J, I guess it will propitiously serve to be allotted one for each of my girls! ), or the redesign of the bombe mane steps to be more green and modern. I aspire never to get predictable. I aspire to keep culture alive. And never to let the enthusiasm fade. And never to stop spinning a tale! I hope this picture post filled with snapshots of this year’s festive Dasara Bombe Habba from our home has filled you with as much joy and inspiration, as I hoped it would! So, my dear dear readers. Was this a joyous respite for you? Did this post rekindle childhood memories? What IS your favorite Dasara tradition? And thank you really, thank you for being part of my virtual Dasara celebration. The festival is no fun without you! Have a fantastic festival !! Also, stay tuned for Part 2 of Dasara Bombe Habba festivities- from Deepa's home. p.s: All photographs are shot by me, and are part of the Dasara Bombe Habba of our home. Please do not use without permission. It's fun to see this pics again this year Supriya, growing we always had so much fun in Navratri and garba and Pooja at home on all nine days and it usually would wind up with havan Dashera but this is nice to read what significance of Dashera and how it celebrated in other part of India. I have few giveaways going on and few are coming this week, you might want to checkout. These are new pictures from this year's bombe setup Nayana! Glad it pleased you this year too! I got a head start on Dasara this weekend just so we could dole out awesome inspiration for Aalayam. Will be sure to check out your giveaway! Lovely description and even more lovely are the dolls display!!! Loved it. And Ahhh those Kannada words:) Adds to the beauty! Alwa, thanks Shruthi. That was the most endearing aspect for me as well. Rejuvenating my kannada script! :) Welcome to Aalayam! Do join us and become a member. We love having like minded folks on board, and are always looking for ways to welcome new members in this growing niche of culture aficionados. Thank you Ramya! I was thinking of you, and your enthusiastic comments all the time, as I was putting together this display and the post! Have you kept bombe too? I would love to see the pictures kane ma! When I wake up everyday to make coffee, I sit and look at the dolls in my family room, looking to see if I can see any signs of movement overnight!! You never know, how the magic of Navrathri works! Supriya, I have never seen such beautifully decorated Dasara bombe setup. Your Subamma story board is the cutest. Dasara habbada shubhashayagalu to both of you and your family. Thank you so much Reshma. As I mentioned in the blog post, sharing with you guys and the larger community makes the whole process so much more fun! Hi Supriya, what more can we say except Enchanting India in US. We just not bring alive our tradition and culture to forefront through these festivals but leaving behind these dolls as heirlooms. Dear reader, you are absolutely right! These are precious family heirlooms to be handed off to my daughters! Thank you for stopping by, and please join us in the growing Aalayam family! Become a member!! We love having like minded folks on board, and are always looking for ways to welcome new members in this growing niche of culture aficionados. 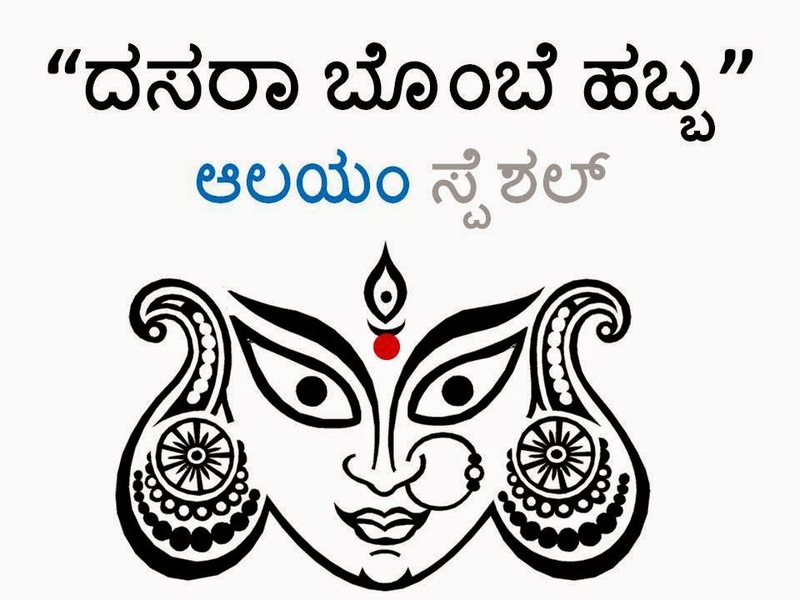 Happy Dasara to you and yours !!! Thank you Shruti! :) That was fun part of the whole celebration for me and my family too!! Thank you for stopping by and commneting! Love this. I am a kannadiga and I loved seeing the writings in Kannada. What an unique display! Thank you Shails. I am honored to bring it to you guys! Happy festive season for you! Do be sure to check out our Diwali giveaway! You stand to win a super gift if you participate! Awesome post! I do a mini version of the gombe display each year and would love to add to it. Can you share your source? Do you bring them from back home? we are a startup based out of Blre. We are a one stop destination to manage the entire life-cycle of a school going kids. Wanted to check, if you would be interested to promote and sell these toys to kids on our platform. do let me know if you need any other information. Apeejay Business Center Provides shared office space and virtual office space or virtual office on Rent suitable to your Business in pune at competitive Rates.